Since the class in February, I have had many ask when we will do this again. I often see people I train get discouraged because they are not seeing results with their diet and exercise combination, I now refer them to Sandra's website and Facebook page explaining how the right combination of food and fitness are most likely the missing piece to the puzzle. People have introduced this lifestyle change and experienced the results they were looking for, but missing with their “old” routine. It was such an amazing, rewarding experience to me, as the organizer of the group seminar, to share my excitement and belief in Sandra's program(s) with others and have them tell me time and again how much they enjoyed and took away from that day. We are already planning our next lecture and class for next fall/winter. Thanks Sandra! I just wanted to personally thank you for coming to our garden club to speak. You truly are so knowledgeable about nutrition and exercise and how they work together. I had so many people come to me afterwards saying how helpful it was to hear how to eat "clean" and how it needs to be a lifestyle change and not a "diet". The shopping list you provided to our group and the biggest mistakes handout were so helpful!!!! It is so nice to know that our group walked away knowing more about how to incorporate eating healthy in our everyday busy lives. And to know its not difficult you just have to DO it! You made that possible by sharing so many things that people had no idea about. I am 40 years old and look and feel the best I have in a decade. Though I was very active and had recently run a marathon and many half marathons over the years, I did so with an extra 10-15 lbs. After having a baby 7 years ago, I never could adjust back to my old weight. A co-worker and friend of mine started seeing a nutritionist, Sandra Koulourides to help with a recent metabolism change that she was struggling to overcome. She told me all about journaling her food and how pairing your food with the right fats, proteins and carbs keep her satisfied. Within 2 months I watched her become very lean. This got my attention. That same friend/co-worker put together a class of 15 people, at our office and had Sandra come give her talk on nutrition. I had already read Sandra's book and heard all about how to eat from my co-worker. However, there was something about hearing it directly from Sandra that put it together for me. She was very motivational and added another layer of clarity and understanding to how we should choose our foods. Over the next few months, I lost that 10-15 lbs. and am I size 2 and holding! I continue to do resistance training, I still run and play tennis but what changed was my approach to food. I view it as fuel for my next endeavor verses something to satisfy me in that moment. By staying satisfied, I wasn't craving snacks, sugar or mindlessly eating. During the holidays, several friends asked about my weight loss and expressed their personal struggles. I realized I had the tools and I wanted to share just as my friend had done for me. After telling this group about Sandra's class, I, very quickly had a group of 15-20 people interested in a class in Gardendale. I booked a room at our club house in the neighborhood, put it on Facebook, texted and emailed everyone invitations and reminders. We had a great turn out. I got a lot of great feedback from every one that came. Not only did they see this as an investment in themselves and their health, Sandra made it a lot of fun. It was such a blessing to share this gift with my family and friends. We were so pleased to have you at the Y in January for the Fuel + Fitness Nutrition Talk and Horizontal Conditioning Workshop! Our staff and members were so receptive to your real, down to earth conversation about eating. I can't tell you how much positive feedback we have gotten and how motivated members and staff are to eat well. It is really an exciting thing to see and a pleasure to support their continued pursuit of health because I know first hand how good they will feel following your guidance. Horizontal Conditioning was, as always "a treat for the core"! All of my instructors were feeling the effects of working their core in the horizontal position, it was awesome! 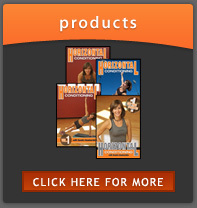 Through your workshop, master class and DVD's they have ideas to utilize in Group Exercise and Personal Training. We look forward to adding a 30 minute Horizontal Conditioning class this spring to ease our members into this powerful and functional style of training. Thanks so much to Sandra for speaking at our Garden Club. She had a wonderful presentation on nutrition and exercise. Everyone especially enjoyed how the information she gave was so relevant to our group, mostly made up of women in their late thirties early forties. She spoke specifically to how our metabolism and hormones change as we enter this age. I know everyone had many great "take-aways". I would highly recommend her for your group or organization. Thanks again, Sandra! It was wonderful! Knowledge is power, and one of the best decisions I have made recently is scheduling Sandra to talk with my preteen/teen girls and their friends about the importance of eating healthy. With so much misinformation on dieting and being thin given to girls at this vulnerable age, Sandra emphasized the importance of fueling your body the right way. She educated them on eating the right type of foods and fats, which mixed with exercise will produce more energy and a lean body. She also taught them about what each snack and meal should consist of and even brought a few examples of foods to show these girls I loved how Sandra focused on being healthy versus being thin, and she did a great job tailoring her talk to the age of the audience. These girls, along with the moms there too, left motivated and encouraged to make some positive changes to their lifestyle. If you ever have an opportunity to schedule one of these talks for your teenager, I highly encourage you to do so. Sandra's FUEL + FITNESS plan was brought to a recent LUNCH & LEARN session in the sales offices at AT&T. The presentation package was an hour of fueling ideas + real-world questions by the employees who chose to attend after an email invitation was sent. The round-table format is a great way to cement all the concepts in her plan as well as have attendees walk away with the tools they need to make good choices in nutrition. Bringing her plan to the workplace was especially effective as it is interactive, no one had to leave the office, and everyone is able to ask questions as they came up. Its continuing education brought to YOU! Sandra is an excellent speaker and dispels all myths and misconceptions about nutrition in this session. It was a great success! Sandra Koulourides spoke to our group of about 425 attendees at a conference on aging held each year. Our audience is made up of health care professionals and lay care givers. Sandra spoke for one hour offering practical advise that we could all follow to live healthier lifestyles. The evaluations were fantastic. "Excellent," "fantastic", "please invite her back", "I did not want her to stop" were just a few of the comments on our evaluations. Sandra offers practical information in a very energized and easily understandable way. We look forward to having Sandra back to our forum in the future. 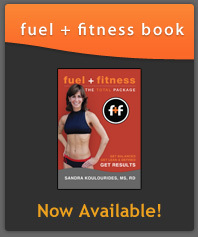 I am proud to provide a testimonial for Sandra Koulourides, Founder of Fuel + Fitness. My testimony is twofold - as an individual who is benefiting from her program and as a business owner who is providing the benefit to all employees interested in getting healthy by gaining knowledge and tools for eating the right food. At age 55, I found myself to be 15 lbs. overweight. I was working out and eating right (at least I thought so) and I continued to suffer with high blood pressure, high cholesterol, acid reflux and difficulty sleeping. Since my exercise and diet were not helping, I began taking medication to treat my various medical conditions. A few years later, my doctor referred me to Sandra for a consultation as an initial step in trying some nutritional changes to assist in gaining my health back. Sandra and I met and she reviewed the basics of her program and we discussed how I should journal all of my food and drinks before our next meeting. I did attempt to follow her nutritional suggestions, but I did not lose weight. I canceled several of the appointments I had with Sandra and was not giving her program a very good chance. However, by my 3rd meeting with her, something clicked with me. I became engaged in the program and very excited about the possibilities of losing weight and feeling better. I am currently 61 years of age. I have lost 15 lbs. thanks to Sandra’s Fuel + Fitness program. I have more energy and feel better than I have felt since my college days. I am so fired up about her program that I have introduced it to my family, friends and more importantly, to each employee who works for my company. I am healthy, happy and physically fit and I probably drive people crazy promoting my success with her program. But, it really works and I am a true believer in the health benefits so easily achievable. Not only have I lost 15 lbs., but I am off of all of the medications to treat my blood pressure, high cholesterol, acid reflux and insomnia. The enthusiasm for Sandra’s program is contagious. It is amazing how healthy one can become with the right food and health practices. Sandra says it is a lifestyle and I agree with her. This lifestyle allows for reduced stress and the ability to enjoy a healthy quality of life. I am passionate in providing the opportunity for this lifestyle through Sandra’s Fuel + Fitness program for the good of our company, for our employees and their families..
We had Sandra come speak to our corporate group regarding the biggest dieting mistakes people make. Sandra gave us all great tips on how to avoid these mistakes and how to plan meals properly so we can eat the right types of food depending on the time of day. Everyone loved her presentation and learned a lot. One month later, we are all still talking about the knowledge we gained. We plan to have Sandra come back to teach us how to read food labels while grocery shopping. She shares information in a way that you can apply to your life – I highly recommend having Sandra come speak to your group as well. We recently hosted an instructor training, master class and nutrition seminar with Sandra and were blown away by her! Her expertise in crafting Horizontal Conditioning is phenomenal – our bodies were pushed to the limits and our brains were full by the end of the training. Her nutrition talk made sense – real food for real people but healthy choices. The most common feedback I’ve heard has been how NICE Sandra is and when are we going to bring her back! And they even said it three days later when their abs were still aching! Sandra was a guest speaker at our annual staff training day here at the Hoover Public Library. Our message for the day was about health and fitness, and we could not have found a better person to effectively convey a more effective message on that subject. Sandra was funny, insightful, and engaging. She put the staff at ease about the challenges ahead, by letting them know that they could make the lifestyle change they needed to have the most productive and positive life possible. She also challenged each of us to make the tough choices about nutrition and lifestyle, as that is the only way we would see results. Sandra has a direct, honest, and personable approach to her message that obviously comes from a passion to see people achieve a healthy lifestyle. Sandra left our staff feeling up to the challenge of working towards a lifestyle shift that would benefit us all both at work and at home. I want to tell you again how much I appreciate you for caring enough about all of us as people. Everyone I have told about our Fuel & Fitness program has commented either about how they've never heard an owner take such a personal interest in their troops…or how they wish their workplace would do something like this. This is just another one of many reasons I love my job! Thank you!!! I am writing to thank you again for speaking to the garden club. The information was very informative and everyone seemed excited to begin working towards improved heath and fitness in 2012. You provided a great service to many and serve as an ispiration to those who struggle with making good choices. 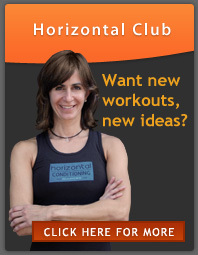 I am looking forward to working on my Horizonal Conditioning! After meeting Sandra at a fitness conference in Mass, I invited her to my studio to teach a horizontal conditioning class and speak about nutriition to our clients. She lead the group in an extreme horizontal conditioning class that had our clients (and me) sore for days. The format and energy of the class was amazing! After class, she spoke to the group about nutrition. She started off by going over the basics of nutrition: carbs, protein and healthy fats. She offered real life suggestions, a grocery list and a couple of yummy recipes. She presented the information in a relaxed tone and made everyone feel like they could make small changes to achieve their results. We all learned a great deal and continue to incorporate the suggested changes to keep us healthy. Sandra came to my studio to do a nutrition talk about Women 40-Plus. I had a great turnout of women who were excited to hear what Sandra had to say. She was wonderful: funny, warm and witty, and great at putting everyone at ease and getting the information across. So many women came up to me afterward and said how inspired they were by Sandra's words to change their eating habits for the better. Two of the women said they left and went right to the grocery store to stock up on the right foods right away! Having Sandra come was a real asset to my new business. After taking Horizontal Boot Camp at a fitness conference, I was inspired to bring Sandra's class to my clients in Greenwich, CT. Sandra came to our club for a half day wellness package which we called Fit & Fabulous at 40+. Sandra taught an exercise class which challenged the strongest of our athletes, and allowed those new to fitness also to participate...all with a single prop, a folded yoga mat. Sandra's style is unique in this regard. Her exercises directly challenge the core, which seems to be everyone's goal these days whether you play tennis, golf, or train for triathlons. After the hour long class, the club provided a "approved" lunch while Sandra explained the importance of fueling your body with easy how-to ways to improve your fitness results by creating a nutritional plan. The day was a huge success with many inspired 40+ women armed with Sandra's book, DVDs, & a shopping list! I invited Sandra to speak about healthy eating at the recommendation of one of our attorneys. The event was well attended. So much so, that we had her back again the following year. Sandra is knowledgeable about what foods should be eaten together and about proper exercise. Her goal is to get people healthy. People like her so much that every time one of us eats something that we aren't supposed to, we jokingly say, "Sandra wouldn't like this, would she?" She has created a contagious awareness in our office of what we should be eating and our office is healthier because of it. We look forward to having her back at our annual health fair where she will speak to us about work life balance. Sandra came to our facility for a nutrition seminar for our members. With very little promotion and word of mouth, I was shocked at the number of people (including staff) that attended. We were still pulling in chairs after the program began. Her message was "clean" and simple - "keep it clean" and/or "get it together". Most of those attending were healthy individuals looking to clean up their nutrition habits and possibly add more to or change up their exercise routine. Sandra offers real-life suggestions, grocery lists, "do's" and "don'ts" and many other great tips that EVERYONE can adapt in their lifestyle! And that is just it, it's a lifestyle, not a diet! The education she offers is invaluable; including information on healthy snacks, the importance of breakfast every morning, fueling your body after workouts and having good protein, carb & fat ratio throughout the day. As a program director, I receive nothing but positive feedback on Sandra's programs and many requests to have her back! I look forward to working with her again! From the first time I took one of Sandra’s classes, I wanted to share her with others. By “her,” I mean her fitness technique, her energy, her motivation, her knowledge and the list goes on. I coach a college dance team and knew that my young girls could and would greatly benefit from both her fitness technique and nutrition knowledge so we arranged a private seminar and class. We began with the nutrition side of the program. While Sandra is quite knowledgeable in this field, she was able to explain her mentality on a level that my girls could understand. Her ideas are simple and clearly, they just make good sense. She was well-organized and gave us handouts including “dos and don’ts,” “shopping lists,” and other helpful nutrition information. Her “recipe” for the fat+carbohydrate+protein combination helped us to see why we were seemingly always hungry. We followed her seminar with a horizontal mini-class. These girls are young female athletes but all agreed they had never been challenged quite like horizontal conditioning. In just a little over 30 minutes, the team realized that the exercises are different and difficult but obviously they produce results. The time we spent with Sandra was invaluable. I wish I had known about Sandra’s Fuel + Fitness program when I was in college as I would have begun healthier eating habits a long time ago. We have all continued to use Sandra’s practices and the new team is already asking if we can do the seminar again this year! Sandra spoke to our law firm one day at lunchtime. Her session was well attended by lawyers and staff alike and very well received. A few days later, I opened the break room refrigerator to see multiple jars of natural peanut butter (a Sandra recommendation) stashed away. I had to chuckle about that one. Seems to me that any business would do its people and itself a great service by inviting Sandra to speak. After hearing Sandra speak at a health training seminar, I felt re-educated on some nutrition fundamentals. While I always thought I was eating pretty healthy, she provided some clarity about how to include fat, protein, and the dreaded carbohydrates into a balanced diet. Six months later, when I shop at the grocery store, I'm making more thoughtful decisions about the food I buy and cook for my family. If there was one take home message for me, it was ADD MORE PROTEIN. Thanks to Sandra, even my kids eat almond butter and actually like hard boiled eggs! At Daxko, we believe that healthy team members are happy team members. To help educate our team on the benefits of proper diet and exercise, we’ve hosted Sandra on a couple of different occasions. She always brings a simple and motivating message. She doesn’t overwhelm her audience with long lists of do’s and don’ts. Instead, she steers clear of the extremes and focuses on a message of smart choices and moderation. That message has resonated well with our team, making Sandra our most popular wellness speaker. As a personal "Fuel + Client" client, a regular participant in her "Horizontal Conditioning" classes, and one of Sandra's biggest fans, I was anxious to recommend Sandra to our Firm's Office Administrator. Sandra made a presentation to our attorneys and staff as part of our annual wellness program and health fair. It was more successful and well attended than any other office wide program we have ever had. Sandra's enthusiasm for healthy living is contagious, and many people have dramatically changed their eating habits and overall attitude towards being healthy thanks to her. We often joke, "What would Sandra do?" when together for Firm lunches or office functions that revolve around food and drinks. We have invited Sandra back to our firm several times since her initial program and look forward to her upcoming talk on "Inner Peace and Power" where she will discuss finding balance in one's life by taking control of it. Her philosophy is simple and she practices what she preaches. I can't recommend Sandra's programs strongly enough. She has enhanced our office culture and has contributed to making Baker Donelson a great place to work. "Sandra's Fuel + Fitness Program has added a valuable dimension to my personalized preventive care internal medicine practice. My patients have enjoyed her informative and enthusiastic presentation on Clean Eating presented in a town hall setting at the local YMCA. Many have purchased the Fuel + Fitness Guide to serve as a helpful reminder on well-balanced, well-timed nutrition for their daily routines. The lessons learned in her talks are very practical and easily implemented. As a physician who has had a life long appreciation for good food, it is especially rewarding for me to see patients reaching their goals through a combined nutrition and exercise lifestyle change! Having tried most of the recommended items on Sandra's healthy shopping list, I can attest that it tastes great too." Before I attended Sandra's nutritional presentation I had been following a fad diet of just fruits, vegetables, fish and barely any grains. I thought this restrictive plan was the only way to get lean and I began to lose muscle mass and my shape. I learned from Sandra that I needed to eat a balance of protein, carbs and good fat at every meal. She provided a shopping list of suggested foods, (many that I was already eating) and combinations/recipes that were delicious and very helpful. This presentation is useful for both people trying to lose weight and get healthy. Through this program, I got my health back! I loved the presentation so much that I went a second time! Our players needed to hear about the importance of nutrition as it relates to energy and athletic performance. Sandra shared practical tips that they can use daily and immediately. They needed to hear about the importance of hydration and why water is better than sports drinks. They also learned how to put together a good pre-practice/ game snack as well as the importance of a balanced breakfast. The players loved the grocery list she gave them. The information Sandra shared will benefit them for a lifetime!